If your field names aren’t the most business user friendly, or your chart layout needs more explanation, you can now rename your axis titles to anything you want. This option is with the other title options under the axis card in the formatting pane. Last month, we released a preview of a new matrix visual with lots of exciting new features, which you can read about in our last blog post. This month, we are adding to the fun with three updates to this preview: column sorting, resizing, and word wrapping. You can sort the matrix now by the grand total and row headers ascending or descending, just as you could with the original matrix. We’ve also added the resize functionality we had in the original matrix to the preview. Just hover over the area between the two columns and your cursor will change to indicate you can click and drag to resize. Finally, you can now word wrap column headers, row headers and values in the matrix preview. Each one can be turned on in the formatting pane under the corresponding card: column headers, row headers, and values. This month we are previewing a major update to our Quick Calcs experience. 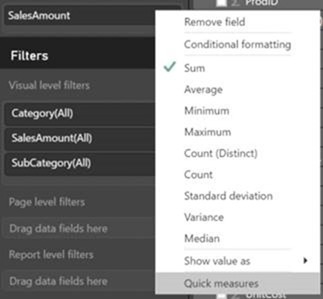 Once you turn the preview on by selecting Quick measures under File > Options and settings > Preview features, you’ll see two new options for numerical columns and measures: Show value as and Quick measures. 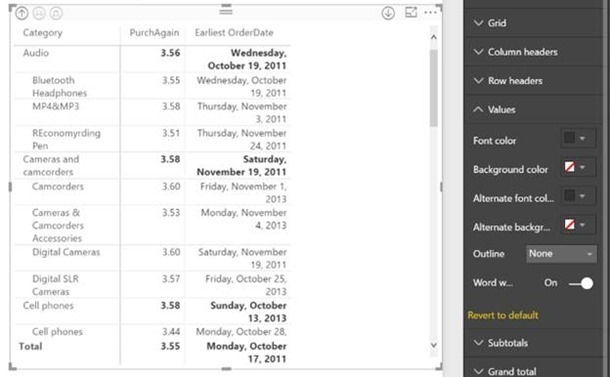 These options will replace the previous Quick Calcs option in the field menu. Show value as is a quick way to change the way your values appear in a chart or table. These correspond to what was previously in the Quick Calcs dialog. Since you no longer need to open a dialog, it is now very quick to update how your values show in any given chart. 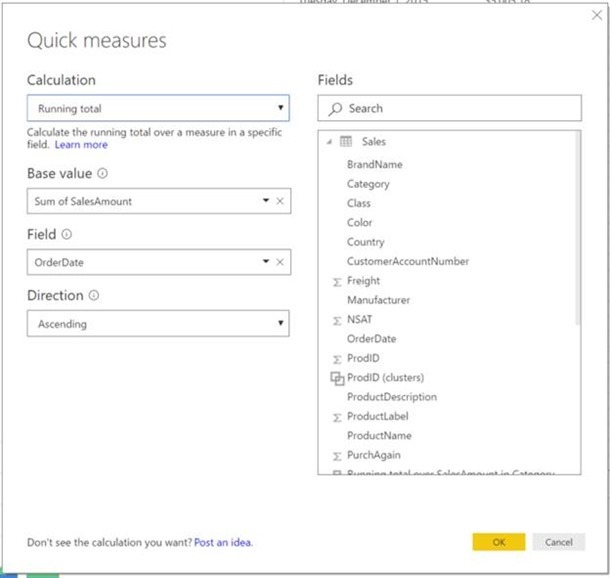 Using quick measures is a very fast way to create new measures based on measures and numerical columns in your table. This means you can now deliver expert level calculations with no DAX knowledge. These new measures are now part of your model and can be used in any of your charts. This means you can use them as a great learning tool or as a starting place for more advanced calculations since the auto-generated DAX is available to you. These calculations let you apply different aggregates at different levels in your data. For example, you could sum revenue up to the month level and then take an average of that total to display at the year level. These calculations allow you to calculate values for a specific category in a column, or compare values to a specific baseline. For example, you could calculate your sales for just a specific category of your products. If you need a measure that shows period-to-date or period-over-period values, the time intelligence calculations let you do this. DAX has many built-in functions that these quick measures make simple to use. This calculation is similar to the YTD calculation, but lets you apply a running total over any field, not just dates. These calculations run simple mathematical functions, which can become powerful when chained together. You can create a quick measure by selecting Quick measures from the field menu, either in the field well of a chart or from the field list. In the dialog, you can pick any of the 19 different calculations to perform on the selected measure. Depending on the calculation, you’ll have different required parameters you’ll need to fill in. You can also change the fields being used in the calculation using the field list on the right half of the dialog. After you fill in all the required parameters and click OK, the quick measure is now part of your model and available to use in your other visuals. It’ll also be added to your existing visual if you launched it from the Field Well of a visual. 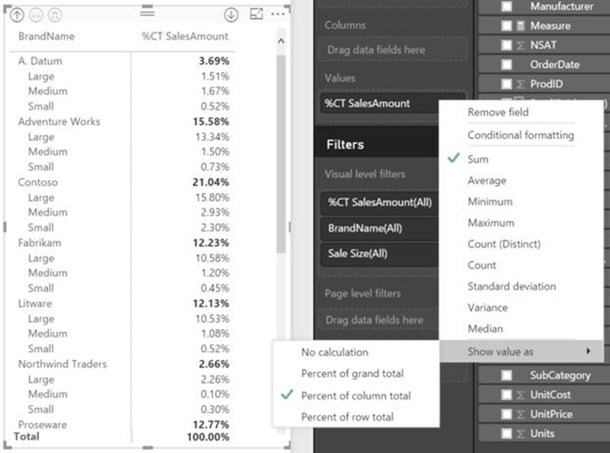 If you want to learn more about this feature, check out our quick measures deep dive blog. We are very excited to announce a preview of Q&A in Spanish. The first step to using Q&A in Spanish is to mark the language of your model as Spanish. 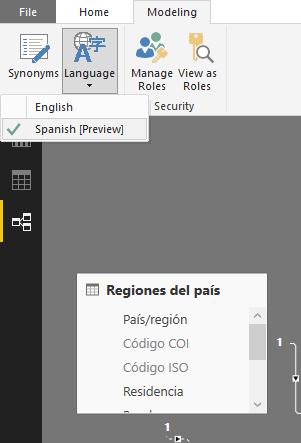 To do this, you first must turn on the preview feature by checking Spanish language support for Power BI Q&A under File > Options and settings > Preview features. Once the feature is on, you’ll find a Language option in the Modeling tab of the Relationship view. 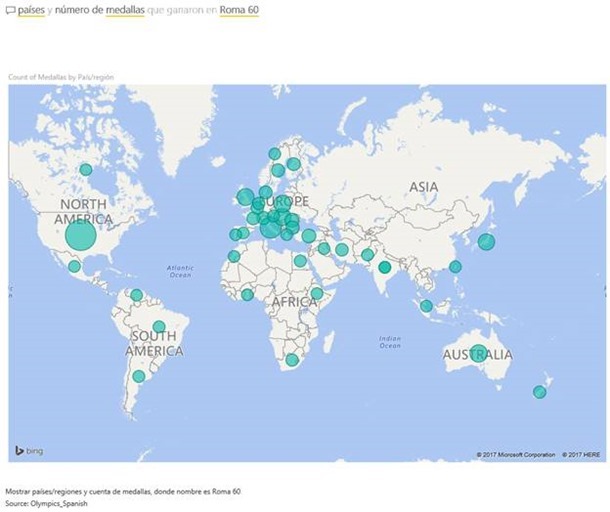 Once your model language is set to Spanish, you can now publish this report to the Power BI service and be able to ask any question you want in Spanish! For example, I can now ask Q&A for the countries and number of medals they won in the Rome ’60 Olympics in Spanish and get the result back! If you have any Spanish language models, be sure to give this feature a try! 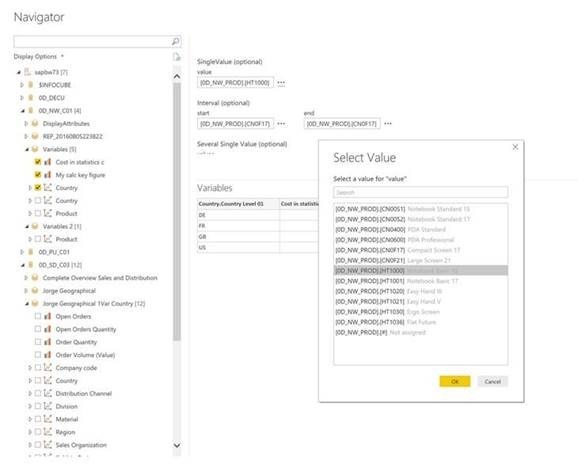 You can now connect to a dataset that exists on the Power BI service. This feature is great when you are part of a team and you all want to work off the exact same model. 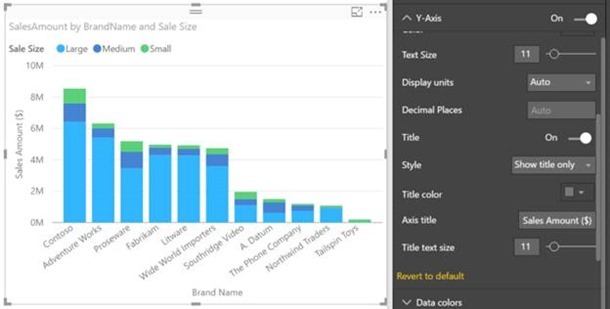 You can craft your model only once, publish it to the Power BI service to create a dataset, and then everyone can create other Power BI Desktop reports off of it. 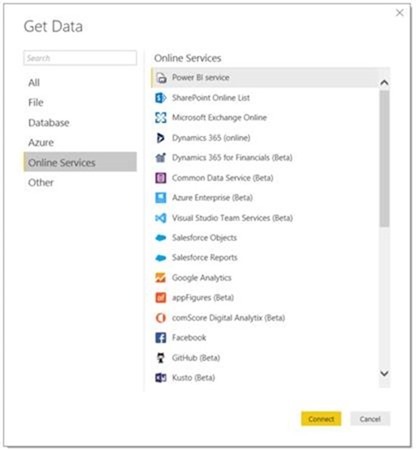 You’ll find this new connector under Get Data > Online Services > Power BI service. You will see a list of all the workgroups you are a part of. Expand one and you’ll see all the datasets that you have edit access to. This includes any datasets in your workspace and datasets in shared workspaces. Select a dataset and you will be live connected to that model in the cloud. You can now create a new report and publish it up to the service to share out. Of course, you can always download the file again if you ever need to. Since this is a live connection, you won’t have permission to do any modeling and cannot join the data with any other sources. To do these type of changes, you will need to make them in the source file and republish to the service for other reports to consume. This is a preview feature, so you will need to turn it on in by selecting Power BI Service Live Connection under File > Options and settings > Preview features. 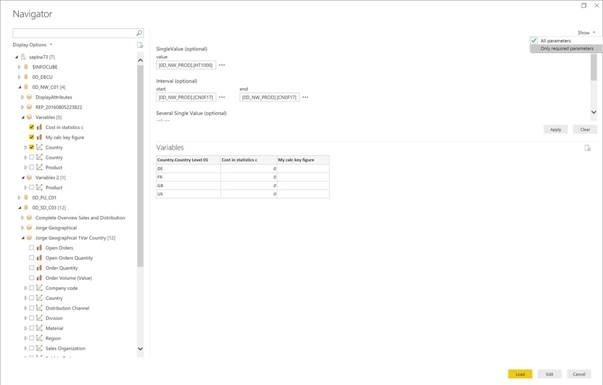 We’re making the Redshift connector available as beta in this release, so you no longer need to enable it as a preview feature. 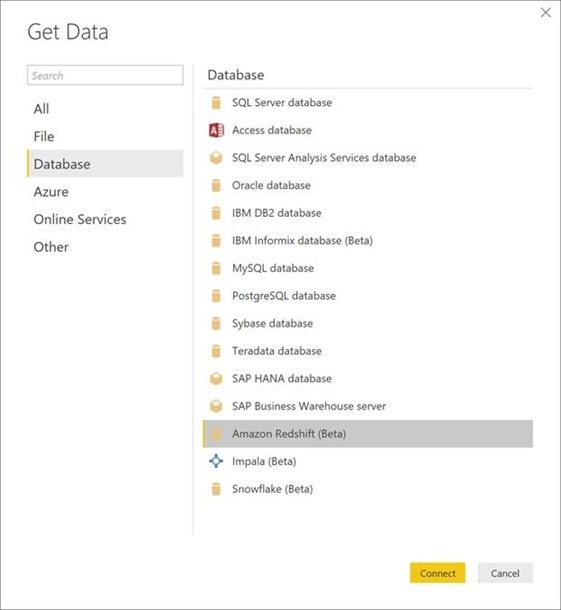 The Redshift connector can be found under the Database category within the “Get Data” dialog. Redshift-based reports have been supported in the Power BI service since March. 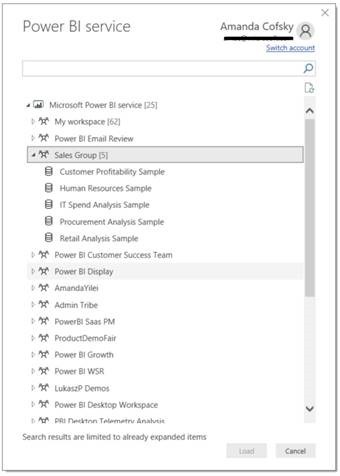 Now, we’re also enabling the Publish button in Power BI Desktop, so you can publish your Redshift-based reports directly from Power BI Desktop. Learn more about the Redshift connector in our dedicated blog. 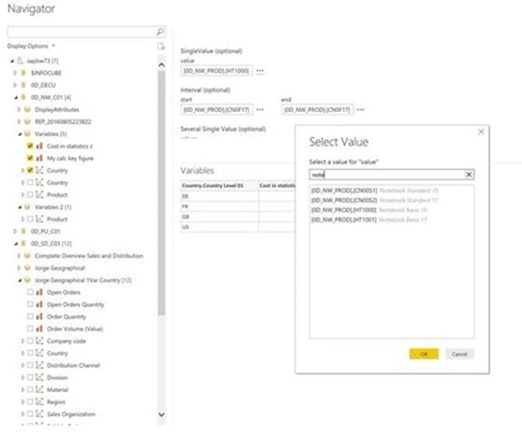 We’re improving the Parameter Input UX for SAP HANA & BW connectors in a couple of ways. We’re moved away from dropdown menus and started using a popup dialog for both single selection and multi selection controls. This new dialog allows you to see both the ID and Caption for each parameter value, as well as search within the list of values by any of these two fields. 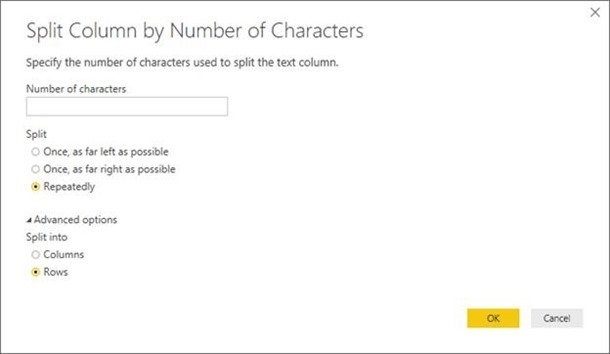 This should make it easier to provide input values compared to the previous experience that only allowed to input IDs. This month we’re adding a new smart data exploration capability to the Query Editor that learns from your examples. Based on your examples of the desired output, we will detect the transformations required and create a new column. This is an innovative approach to defining query steps within the Query Editor that simplifies the process for beginners as they no longer need to come up with “a strategy” for how to transform or extract data from other columns, or how to define those transformations in the Query Editor. We’re just getting started with this feature and plan to make improvements incrementally in subsequent releases. A list of all currently supported data transformations is available from the “Help” link in the command bar while using this feature. Your feedback about this feature is really critical to us in order to influence future enhancements, so please do not hesitate to contact us via the “Send Feedback” button, also available from the command bar. 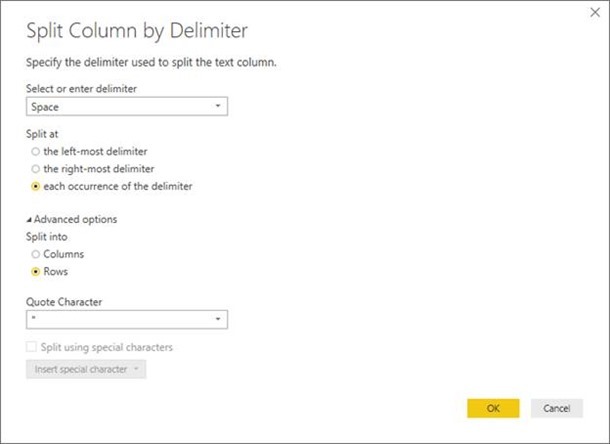 We’ve added a new option within the “Split Column By Delimiter” and “Split Column by Number of Characters” transformation dialogs that allows you to specify whether to split into new columns (default behavior) or split into new rows. This new option can be found under the “Advanced Options” section in these two dialogs. We have added a Basic mode to the Group By transform dialog that simplifies the UI for you to group by a single column and define a single output column. You can switch between Basic and Advanced modes within the Group By dialog by selecting the desired option at the top of the dialog. When working with tables that have a large number of columns, it can be hard to scroll in the Query Editor Preview in order to find the column that you want to apply transformations to. 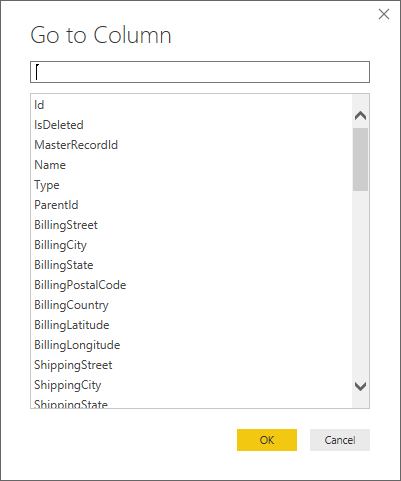 In this month’s release, we’re adding a new “Go To Column” option within the Home tab in the Query Editor ribbon that allows you to search within the list of columns and select the column that you would like to scroll to and select.